The city is a powerhouse in terms of the media and finance industries. It’s a modern and buzzing place, which has been transformed over recent years with massive investment. Dusseldorf was voted the 6th most liveable city on the face of the earth in 2012. I realise it’s 2018 but, if you really think about it, how far downhill could it have gone since then? And what if it’s even better now?? Clearly, I needed to find out. Anyway, here’s the tale: I was watching Casino Royale the week before Easter and telling Les that we *must* visit Karlovy Vary in the Czech Republic. He was half asleep at the time and lazily agreed. After a few hours of searching, we realised we couldn’t possibly get flights over the holiday weekend, so we booked a trip to Düsseldorf instead. That’s pretty much as detailed as my trip planning gets. And that’s the way I like it. The TV tower stands at an impressive 240 metres high and can be seen from literally anywhere you go. Based in the MedienHafan area, on the banks of the Rhine, the building is a telecommunication tower built between 1979 and 1981. The main building includes a light sculpture, which operates at the largest digital clock in the world. 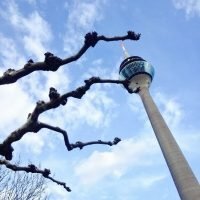 The tower is the tallest structure in Dusseldorf. The tower has an observation deck and bar/cafe on the 168th floor. You can reach this by paying 9 Euros to be escorted to by a rather stern man in an elevator. There’s also a restaurant on the 180th floor but, at the time of writing (April 2018), it was closed for reno work. On the observation level, you get a 360 view of Dusseldorf and can happily wander around the bar, annoying people who are there for quiet drinks, by pointing out the window after excitedly spotting the top of the parliament building. Or not. You know, you do you and I’ll do me. MedienHafan (Media Harbour) is a large business district to the south of the Rhine. It’s been the subject of extensive regeneration in recent years and is my favourite part of the entire city. We rented an apartment across the street from Neuer Zolhoff and had a lovely few days in the peaceful enclave. It’s pretty enough during daylight hours but, by night, its multi-coloured lights are stunning. Although the harbour and waterfront are dark, the light from the Rhienturm and the surrounding hotels and buildings make it really special. Innside Hotel and sky bar are especially beautiful as their lights twinkle off the surface of the river. We wandered, in a downpour, just to see the lights. When I first started researching Dusseldorf (like, two days before we left Wales…), these buildings seemed to be amongst the most photographed designs in the city. Designed by Canadian-born architect, Frank Gehry the complex known as Neuer Zolhoff is a set of three building; one red, one white and one that looks like it’s wrapped in aluminium foil. They all look at bit like they’re melting a little in the sun, tbh. However, the designs are so unique and quirky, it’s easy to see why they’re so popular. Translating to English as ‘Old Town’, this is the historic centre of Dusseldorf. It’s a lovely, but peaceful area, with around 300 bars. There are countless options for eating and drinking here, and the views of the Rhine along the Promenade are rather lovely. We spent a good few hours just casually wander between the street and visiting the museums before stopping off for coffees and strudels. There’s some great street art in the old town, as well as a host of beautiful buildings. It’s the perfect place to get lost. To the north of the city centre is the pretty little suburb of Kaiserswerth. Sitting on the banks of the Rhine are the Roman ruins of the 12th-century castle, Kaiserpfalz. Kaiserpfalz isn’t in too bad a shape for a ruin, tbh. It’s possible to climb to the top and have a look south of the Rhine and towards the city. I sat on a park bench and let Les do all the climbing. I enjoyed the view from a park bench, surrounded by daffodils and basking in the early spring sunshine. Not too shabby for Suzi. The area is one of the oldest in Dusseldorf and also houses the Deaconess’ Institute of Kaiserswerth, which once employed Florence Nightingale. Also known as ‘Ko’ for short, this boulevard is as well known for its host of exclusive shops (think Jimmy Choo, Prada, Lagerfeld and Tiffany) as for its pretty central canal. In addition to its high-end shopping, Konigsallee is also famed for its nightclubs and restaurants. This makes it a pretty good shout for a full day of entertainment if your bank manager can handle it. The canal along the centre of the street looks rather pretty when lit up in the evening. What are your favourite sights in Dusseldorf? Ha! Yeah, it’s sometimes all a bit ‘fly by the seat of your pants’ in my house! I do love a last minute trip, though, and Dusseldorf was just amazing!